A woman motorcycle rider who was tired of spending time searching for appropriately sized clothes, accessories and gear for my motorcycle. Having been a woman motorcycle rider for about fifteen years, I have experienced this frustration on a yearly basis. 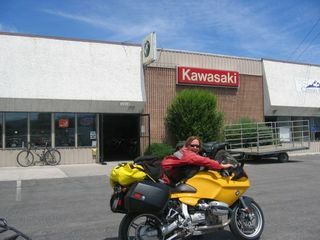 The market has improved somewhat, in terms of motorcycles, apparel, and gear, but not enough - in my opinion. But, even with the growing numbers of women on motorcycles, I still find myself spending too much time looking for the stuff I need for my motorcycle and for me. I wanted to build a website with information about the stuff that really works - and the stuff that you really need as a woman motorcyclist. I've learned what features a ladies motorcycle jacket needs to have in order for it to work. AND, I've learned often the hard way about raingear, heated apparel and women's motorcycle pants and boots. I am also a woman motorcycle rider who would like to encounter more women who ride - and would like to encourage more women to learn to ride, and to ride safely. So, if you are a woman rider, or would like to be - bookmark this page, and check back frequently. Learn from my mistakes and mis-adventures as I travel around on my motorcycle. And travel around on my motorcycle I will do - adventure travel in Europe and the states, and long distance travel almost everywhere I go. I've got tips for all types of motorcycle trips. Over the past 15 years, I've ridden all over America, and have had the opportunity to travel on two wheels through Europe - Spain, Germany, Italy, Austria......France. 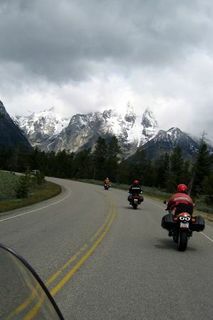 I've been lucky to travel with men, and other women, all of whom have shared their knowledge and love of motorcycling. I've learned, often the hard way, what works and what doesn't, what you really need and what you don't. I've learned how to find the best motorcycle helmet, pack for a motorcycle trip, how to secure my motorcycle on a ferry, and how to safely ride through some really twisty roads, gravel roads, and how to enjoy long patches of highway riding. I've even learned how to ride on the back! Her-Motorcycle.com is for me, a woman motorcycle rider, and for all women on motorcycles, including those who ride 2 up. Spend less time looking for the right motorcycle apparel, gear and information, and spend more time riding. And when you can't ride, go visit the new Her-Motorcycle Forum - a friendly online discussion forum for all things motorcycle.com. Open to women, young and old, newbies and experienced riders! If you are new to Her-Motorcycle.com, please look around, add us to your Twitter feed, and come back when you need to do a little daydreaming about motorcycling. 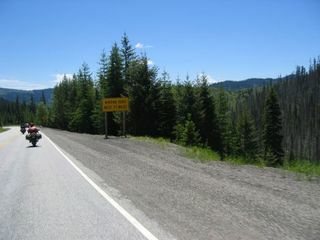 Or, tell us about a great road for motorcycling, or an adventure at a motorcycle rally. Write a post about why you like to ride, or ask a question about motorcycling, or answer someone else's question. And, if you are frequently a passenger on the back of a motorcycle, you can tell us about an adventure you had while riding "pillion". If you have some suggestions for me, questions, comments, or would just like to say "hey", please fill out our Contact Form - and I'll get right back to you.............unless, I'm off on some motorcycle adventure!